For the past ten years, Swansea have been doing most everything better than other teams in English football. They play attractive football, make astute player purchases, and don’t go into debt. The smart buying has (mostly) continued this offseason, and when the new additions to the squad are combined with Michael Laudrup’s tight defensive system, the Welsh club should have a decent year both domestically and on the continent. Though there are reasons for Swansea fans to be optimistic, fans used to their team playing in the lower divisions have reason to be skeptical of how strong the squad actually is. A close look at the team’s numbers from last year reveal the they may have been riding quite a bit of luck on course to their strong league finish. Luck can turn at any moment, and with a tiring Europa league campaign looming, the squad will need to be reinforced to remain competitive. Last season, the Spanish Welsh upstarts secured their second highest league finish ever in the top flight of English football, won their first major trophy, and qualified for a European tournament for the first time since 1991. 2012-2013 was perhaps the club’s most successful season ever. Despite their strong performance, a few metrics suggest the Swans’ run of form was due to luck, and will be unsustainable for next season. The team’s shot dominance was in the bottom half for the league, while their PDO was unsustainably high. Their good luck in front of goal was tied to Michu’s unusually good ability to convert shots on target into goals, and the sustained efforts of the Swans’ keepers and defense to prevent good chances taken by opponents from becoming goals. A look at the Swans’ shot positions last season, both for and against, confirm they may have been lucky in securing a 9th-placed finish. The shot map above reveals the team not only conceded a higher volume of chances than they created, but also that the chances they conceded were of slightly higher quality than those taken. The first map shows that when attacking, the team had good shot placement for a mid-table team. 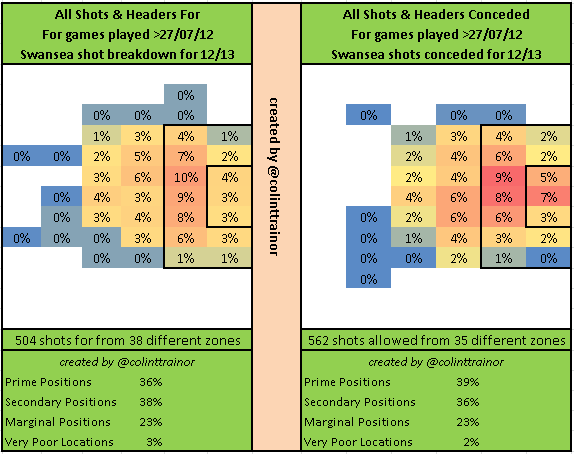 Shots from well outside the box were kept to a minimum, while 40% of shots were taken from central areas within the box. Michael Laudrup’s attacking system appears to be sound, and the Swans’ will keep converting a good number of their chances next season. On the other side of the coin, Swansea did not do a great job preventing shots from prime positions (the central area of the box). Looking at both maps above, it’s clear the Swans’ advantage in shooting from good positions is nullified by tending to concede shots from almost identical areas. The team’s high pressing defense was always likely to allow their opponents good attacking chances, to the team may need to step up their offensive efforts to make up for their high-line style of play. But… was the Swans’ 9th-placed finish all down to luck? Or did Michael Laudrup secretly build one of the best defensive systems in all of Europe? Looking at the team’s Expected Goal Efficiency (ExpG) gets us closer to an answer. In a nutshell, ExpG is a performance measure which gauges how many goals a team would have scored if they were perfectly average at converting chances, based on the quantity and locations of shots they took. Similarly, the defensive measure of ExpG compares how many goals a team would have conceded had they been average defensively and faced the same number of shots from the same positions. “Average” in this case means average for all teams in the top 5 leagues in Europe last season. The Swans’ attacking efficiency score of 1.02 means that they scored an extra .02 goals for every shot they took compared to the average team. This number isn’t especially impressive, but shows Swansea were pretty average at converting their chances. Now, have a look at the ExpG for the defensive side. It’s a value of 0.796! In other words, the Swans conceded over .2 goals fewer than the average team, considering the shots they faced. That score puts them among the top 10 teams of Europe in terms of defensive efficiency. If Swansea continue to be efficient in defending, their finish in mid-table will be secure. There is some evidence the Swans strength in defense is real. Ashley Williams’ lead the league in blocks, and Chico had a remarkable rate of interceptions. Both Michel Vorm and Gerhard Tremmel were solid between the pipes as well. Still, if it turns out that efficiency in this case is really luck, expect Laudrup and co to struggle a little more in the coming season. The undoubted offensive standout from last season is the 2 million pound man from Rayo Vallecano. He scored 18 of their 47 goals last season, well over a third, and none of them penalties. Can his performance be replicated? Michu’s shots on target % was only 42% last season, which is quite low. 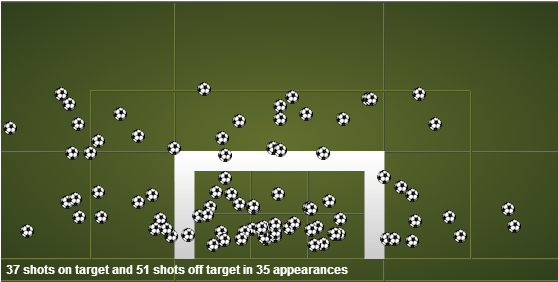 However, of the 37 shots which did his the target, he converted almost 50%! As we can see from the attacker’s shot map, his low shooting accuracy comes despite taking shots from mostly good areas. Though he shoots at the sides of the net at a decent rate, Michu still sends many of his shots to the low, central areas of the goal, right at the keeper. Unless he improves his shot placement, last season’s bargain attacker will almost certainly score at a slower clip next season. To fill the Michu-shaped void and keep the team on course, Wayne Routledge, Pablo Hernandez and Nathan Dyer will all need to step up their goal-scoring efforts. In light of Michu’s lucky foot (and head), Laudrup and the board brought in Wilfried Bony to score some of the goals that he bagged over and over again last year in the Erdevisie. Goals come at a premium these days, and Bony’s price tag of 12 million euros was double that of the team’s next most expensive player. The purchase is something of a gamble for the usually conservative Swans, especially given that strikers from the Eredivisie have a checkered history of success in the EPL. Even within his own league, it’s difficult to analyze Bony’s performance, as there is a paucity of public data for the Dutch competition. Evaluating how he might fit into the Swans’ system will require a sketchier, qualitative approach. 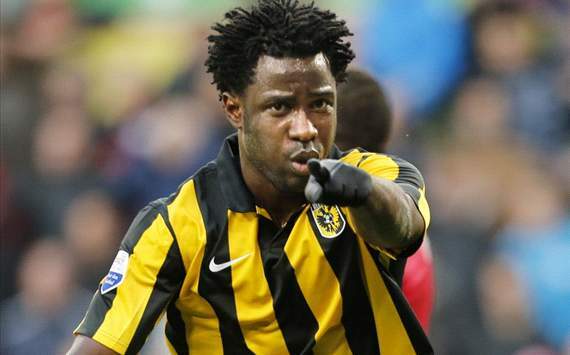 Even for his large fee, Bony fills quite a few of Swansea’s needs for a forward. He has the strength and size to hold up the play while Michu, Dyer and Routledge move forward, and his runs will create bigger spaces for Michu to work in. His height should help the Swans’ reduce their exposure to set piece shots, which were a real problem for the Swans last year. And of course, his effectiveness as a striker makes him a goal-scoring threat in his own right. Last season he scored 1.05 goals a game, so even if that rate declines by half, he’ll score 15+ goals if healthy. His assist rate last year of 0.27 a game is nothing to sniff at either, and he should play a minor role as a chance creator as well. Well… it’s really hard to put a positive spin on this one. Going by the numbers, this was as bad a purchase as Swansea could have made. Despite playing 924 minutes as an attacking midfielder last year, Shelvey had a points total of 1g/0a. One goal, despite taking almost two shots every game that he played. That’s awful. Really, really awful. Looking back through his past seasons reveals a similar pattern of consistently poor performance. Is there any reason to be optimistic about Shelvey? It’s been suggested he brings much-needed physicality to the Swans’ midfield, though it’s hard to determine if that’s true. He’s a British international, something which the Swans’ need to compete in the Europa League. More generally, Shelvey has never been allowed to play consistently at Liverpool, and was never allowed to settle in one position in the midfield. He’s likely to be gash, but perhaps he won’t be quite so garrish as he was at Liverpool. If you’re a fan of Michael Laudrup Bargain Buys ™, Canas is a signing is for you. He was essentially free, and is so obscure he doesn’t even have YouTube compilation. The ex-Real Betis midfielder gives the team a physical option at DM, and his stats are as good as you’d expect for a top 7 La Liga defensive mid. He’s already been in a fight with Cardiff’s new midfielder, Gary Medel, so he’ll feel right at home during the South Wales Derbys. Pozuelo only started 4 matches with Sevilla last year, so I have nothing on him. Hopefully, he can keep doing this. Swansea’s good performance last year remains a puzzle. Was the team so good defensively because of luck, or was it genuinely down to tactical mettle and player skill? This season will provide some answers. Otherwise, the team look set for another good year. Bony will be exciting, Shelvey will have a career renaissance, and Pozuelo will be the next Michu. Well, none of those are for certain, but give a Swansea fan a break. It’s not often we have reason to be optimistic. Many thanks to Ted Knutson for the opportunity to write, and for the Shot Dominance Metric. A huge thanks to Colin Trainor for his great work on the shot maps and ExpG ratios. ExpG figures are based on a model developed by Colin Trainor and Constantinos Chappas, and measures how many goals teams are expected to score/concede based on shot locations. More of their work can be found in our archives. Ryan Tolusso is a student of International Trade Policy at the Master’s Level. He is currently based in Canada).